Classic Italian tomatoes suitable for sauces as they have very thick meat. The fruits are medium sized, oblonged and firm, even when they are ripe. Plants are very strong and need support. 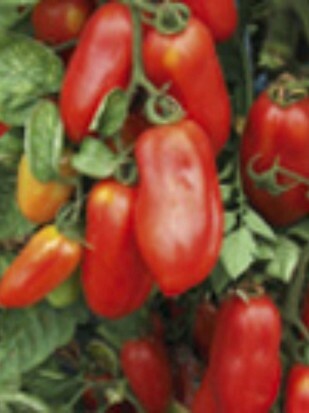 It is a pure variety of tomato. Tomatoes are sown indoors in February and March and are lanted outside after the danger of saline has passed (usually after 15th of May - or before in greenhouse). At that time, tomatoes can also be sown directly to a permanent place. For germination it does not require such high temperatures as bell peppers. The optimum temperatures are from 18 to 20° C.
Tomatoes need a lot of water, but they do not need to be watered daily if they are properly planted. In the soil, we make an elongated hole (slightly shorter than the hight of the seedling) and plant a seedling vertically in it so that only the top of the seedling (peak and 2-4 top leaves) will be seen. The roots and the rest of the stem we cover with soil - tomato will then grow roots throughout the stem which is covered with soil. Because of that, tomato will have a very strong root system and it will be able to pump water from the depth, therefore it won't be necessary to water it constantly. It is very important that we plant the tomatoes sufficiently apart. If we plant it too close there will be more moisture in them and fungal diseases will be more frequent. We recommend planting the seedlings 75 - 100 cm apart. If you plant smart space-wise, we recommend planting different plants together (between the tomatoes, for example, salads or brassicas). We do not plant other fruit vegetables with tomatoes. Good neighbours are basil, salads and brassica. Most tomatoes are pinched which means that we cut the leaf or stem that is growing between the main stem and the leaf. We do not cut the leaves because they are necessary for photosynthesis, by which the plant produces sugar that is stored in the fruits. We harvest the tomatoes on the day for flowers (according to Marie Thun's calendar). At that time, we encourage the setting of new flowers and thus new fruits. If tomatoes are harvested on a day for fruit, this stimulates faster maturation, rather than the setting of new fruits. On this day we harvest at the end of the season as we wish that all of the fruits that we harvested become ripe. On the days for leaves we leave tomato plants completely alone, otherwise we can expect the first signs of fungal diseases on the plant and fruits in the near future. Tomatoes, harvested on a day for flowers, remain fresh longer, therefore we can harvest it on that day more and it will remain through the days when harvesting is not recommended.